Cache functionality is an essential for performance and SEO optimisation. W3 Total Cache is my favourite plugin for caching and minifying need. Thanks to their customizability and powerful options. In this article, we’re going to solve a W3 Total Cache error related writing the .htaccess file. Generally, this error is not an outcome of W3 Total Cache plugin, albeit this is a consequence of a Security Plugin. For example, an iTheme Security plugin has the option to deny access to core files including .htaccess, upload directory. Which might hinder the operation of dynamic websites. Whereas, static websites might feel comfortable with the utmost level of security by these security plugins. However, you can manage the plugin smartly to match with your need. At first time, the error may look very terrible and that’s why, some user might try to access manually to .htaccess file. It’s very time-consuming. The roots of this error in the file permission. Normally, most WordPress files have 644 level of permission. Which means the file readable by the owner, group and public; but writable only by the owner. 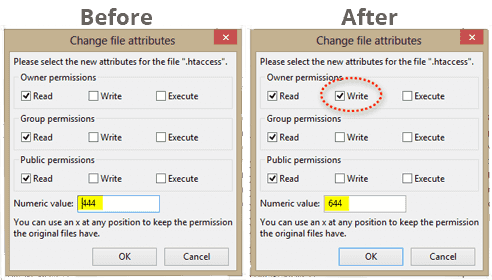 Here, you have to change the file permission to 644. And what a magic, after refreshing the page there no bad notification. Everything goes smoothly. For this, you can use cPanel or FileZilla or other FTP client. Following is the screenshot of FileZilla. This solved my W3 . htaccess issue!!! Glad to know.. thank-you Praveen..! i changed as per your instruction. Make Sure public_html directory has right permission (i.e. 750 or 755). Let me know whether it has solved or not.